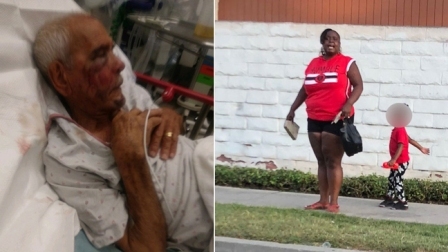 A woman suspected of using a block of concrete to repeatedly beat a grandfather in his 90s in Willowbrook, allegedly while telling the man to go back to Mexico, was behind bars today. Laquisha Jones, 30, of Los Angeles, was arrested around 10 p.m. Tuesday near 60th Street and Crenshaw Avenue, according to the sheriff's department. She was booked on suspicion of assault with a deadly weapon, and her bail was set at $200,000. Jones is suspected in the 7:30 p.m. July 4 attack on Rodolfo Rodriguez that occurred near East 118th and Robin streets. The aftermath of the assault was captured on cell phone video that showed Rodriguez on the ground, blood covering much of his face from the severity of the beating. Rodriguez told CNN he is 91 years old and will turn 92 in September, but a GoFundMe page established by his family states he is already 92. Relatives said Rodriguez was visiting from Mexico and was taking an evening walk around the neighborhood on the Fourth of July. He said he passed the woman and a small child, and then the woman attacked him without provocation. “When I tried to videotape her with my cell phone, she threw that, same concrete block, tried to hit my car,” said Misbel Borjas, who managed to snap a photo of the woman showing her still holding the piece of concrete. Despite Borjas’ account, sheriff’s investigators said Wednesday that while they have not identified a motive for the attack, it was not believed to have been a hate crime. “Through their investigation Century Station detectives have discovered that this is not a hate-related incident,” according to the sheriff's department. Rodriguez said he heard his attacker tell a group of men standing nearby that he had tried to grab her daughter — which he denies — prompting the men to kick him when he was on the ground. Authorities are still working to determine if there were other suspects involved. Rodriguez has since been released from a hospital and is recovering at his family’s home. He suffered several broken bones, including a shattered jaw and a pair of broken ribs. Anyone with information on the case was urged to call detectives at (323) 568-4800.